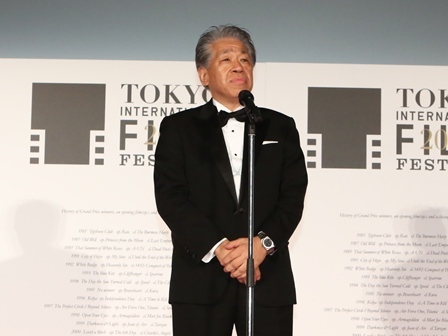 “Well, hasn’t it finally started to feel like an international film festival at last.” Director General of the Tokyo International Film Festival, Yasushi Shiina is at the helm for the third year. Until now, he had been pouring his energy into increasing awareness among the rest of the world, but now he projects an image of showing a proactive stance on the firm foundations. One of the biggest pivotal points has been disseminating information about Japanese films and the establishment of the newly created section “Japan Now” which included unreleased films and also thoroughly covered this year’s hits and most talked-about works, which included a special program of director Masato Harada. The Japanese Cinema Splash competition, focusing on independent films was held as before. The fact that three Japanese films were selected in the competition: FOUJITA, The Inerasable, and Sayonara, which is a symbolic phenomena. In addition, he has also tried enriching this year’s festival even more with anime, a powerful contribution from Japan which he has shown as his particularity since his appointment, which includes the special program –Mobile Suit Gundam, following on from director Hideaki Anno of last year. We moved the sub-venue from last year’s Nihonbashi to Shinjuku. There were screenings at Shinjuku Piccadilly and Shinjuku WALD9, which have the largest and second largest number of film audiences respectively in the country, and TOHO CINEMAS Shinjuku which opened in April this year. It was held in conjunction with the Grand Shinjuku City Festival hosted by Shinjuku ward, but there were only two screens for our festival at each theater, obviously it was lacking in the film festival’s atmosphere. Even at this state of the Tokyo International Festival, there has been a definite increase in overseas interest, and the number of registrations for the foreign press has been increased from 789 last year to 820. It seems like this number should be expected to increase in an upwards curve as we are heading towards the 30th festival in 2 years’ time, and along with the Tokyo Olympic Games in 2020. He says in his personal goal feeling that he has achieved a “60%” this year, which is only 10% more than last year’s for this year’s festival, his reflecting comment stays severe as always. His words indicate rough going ahead, but he was not pessimistic. Shiina was full of ambition, looking more than one move ahead or even focusing on two or three moves ahead.